Moeser Lane and Pomona Ave. Write-In Presidential Candidate In California!! Thanks to David the mobile notary for donating his services for this event! Click here for larger poster! Read about it and see photos here! 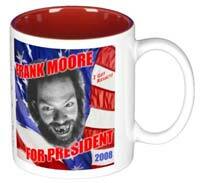 Frank will speak about his plan to create a humane, sustainable, and just plain enjoyable society! Meet the candidate! Have some snacks! Get involved in this inspiring campaign! Look for the BALLOONS to guide you to the courtyard! Drop by Frank's info table to meet and talk to the candidate and check out the swag! Peoples Park is located in the City of Berkeley, a few blocks South of the University of California campus. The Park is bounded on the East by Bowditch St., on the South by Dwight Way, on the North by Haste St. and on the West, it's a short half block from Telegraph Avenue. 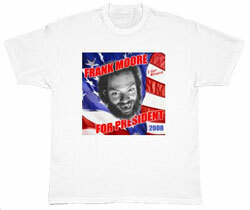 Here is your chance to grill Presidential Candidate Frank Moore! Watch video of the speech here! 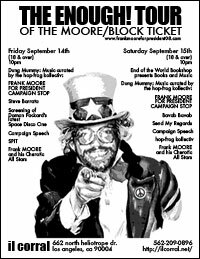 The next stop on the “Enough!” tour of the Moore/Block Presidential Campaign will be the “How Berkeley Can You Be?” Parade and Festival. The Parade starts at 11 am at the corner of California and University Ave. The Festival starts at noon and is the termination point for the Grand Parade Civic Center Park, (Martin Luther King Park), in between Martin Luther King Way and Milvia, Center and Allston Way, in the heart of downtown Berkeley. Photos here ... and more photos here. Last modified February 3, 2017. This site is designed and maintained by Michael LaBash Graphic Design.